I picked up the vintage Visetti that Steve custom restored just for me this weekend. My wonderful old Singer sewing table does not accomodate a built in machine but rather a tabletop. I took the box from my old Riccar machine and customized it with a bit of old wallpaper to make it fit to house the pink dream Visetti. We are just getting acquainted but I should be sewing like a streak pretty soon. Oh.My.Gosh. Silly as it sounds, that knob is my very favorite part!! She is certainly pretty. I love the coordination with the wallpaper. It’s not common to find Visetti’s around here, but I did find one the other day on CL…I had to hold myself back…buying vintage machines is just so tempting! but I just got rid of a load, I need to be good…right?? Can’t wait to hear how you enjoy sewing with this pretty girl. OMGosh I figureded it out finally Sue !!! 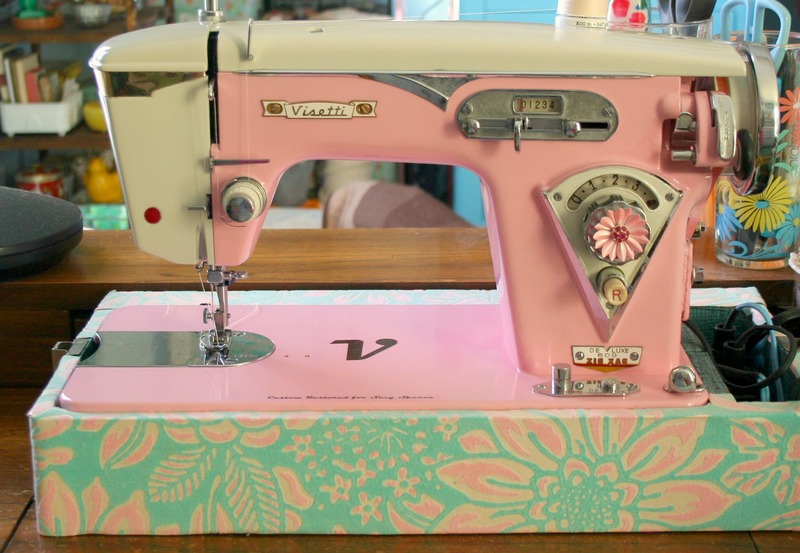 I have been obsessed with finding a pink Visetti since I first saw this machine, and the knob is my favorite part too! Who is Steve and how can I reach him??? Did he come up with that flower knob? I just found the same model Visetti in teal, which I also like, but depending on the condition when I get it, I might want to have it restored, in lavender! 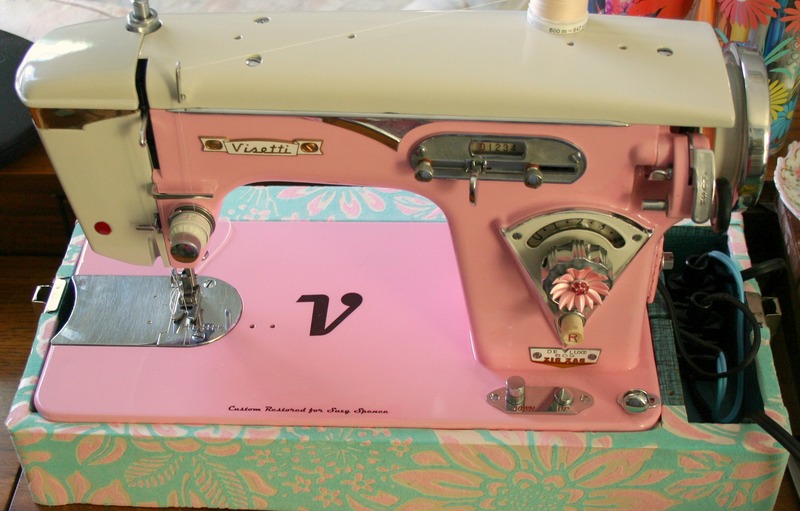 How does your pink Visetti sew?